I think Paula from Vintage Kitchen Notes probably doesn’t need much of an intro. She is one of the nicest people I’ve ever come across through my food blog. Paula is involved with so many groups and makes the most incredible cakes and desserts. She loves baking homemade breads and bundt cakes as much as I do! Her latest Caramelized White Chocolate Raspberry Cheesecake was pretty incredible. I adore Paula’s Soft Pretzels with Spicy Beer Cheese Sauce. I would go to Argentina just to get a sample of her Dulce de Leche Mille Feuille…serious swooning happening here! Ok, enough of my bragging about Paula. She is a friend that is dear to my heart and I’m so happy to have her here on Cake Duchess today…take it away, Paula! I brought a cake today that reminds me of sunny days, because I´m so happy to be guest posting for Lora today. I was reading her blog before I started with mine, and to call her my friend now is really a wonderful thing. I feel we would be sharing recipes, trips to the farmer´s market and coffee if we were neighbours, so I´m excited to meet her readers. 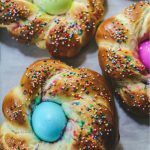 And she goes to Italy every year, and bakes us those stunning filled braids and cakes, really, how can that not be reason enough to be friends with her? A lot of food memories are triggered in our earlier years, and while I still feel the same about some of them, like fish, others I happily erased and wrote over. The coconut things that were sold in bakeries back in the day here, that is Buenos Aires the city where I live and blog from, were certainly not meant to make devotees out of us. My mother didn´t bake, at all, I don´t think even boxed cakes were a staple in my house, so we just had to embrace the awful dry coquitos, little towers of coconut and egg whites, or view those shredded white strands sprinkled over finished doughs as the decoration of fruits tarts and such, which gave the poor coconut a very bad rep. It all changed when I got my paws on some English books and started baking coconut cakes, the real deal. I even managed to change the way everyone felt about coconut around me. At that time I was married and had quite a lot of stepkids, five of them, and shared my weekends with them and their friends. So I managed to convert a large audience. Nowadays, coconut and dulce de leche bars are all the rage here since small artisanal pastry shops and cafes appeared. Even the infamous coquitos got a makeover at some places. 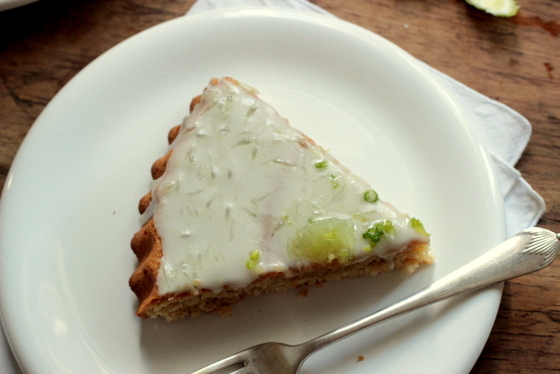 That said, this coconut lime cake is a real find, a great recipe that I will be making more than once. What sets it apart is the texture of the cake, which is dense and has a perfect balance of both main flavors, and the frosting. Oh, the frosting, sweet but with little bursts of lime every time you take another bite. A lime is peeled, white pith and all, and then the wedges are cut out, all pulp. When you mix it into the powdered sugar frosting, some get crushed and others don´t. That´s the essence of this cake and what sets it apart. You can also juice the lime, but be sure to add the pulp also, the juicy flakes that stay all around the lime and get thrown into the trash. But cutting the lime in segments, or supreme, is the best way to do it. It´s not hard really. Another interesting part of this cake is that the coconut used in the batter is first mixed with the lime juice and let to soak for a while. 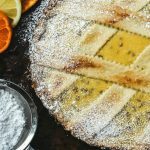 Now, there is a new trend, mixing citrus zest with salt or sugar, and I love it. But soaking the coconut in the juice is such a great idea. I think it does add a different flavor to the final cake. And you all know by now that a recipe that works is not a recipe you change. Thank you, Paula, for this amazing coconut lime cake. You know I adore coconut in my desserts! You can find Paula at Vintage Kitchen Notes. 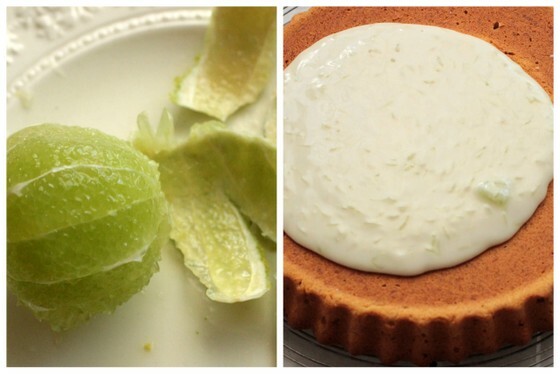 One hour before starting the cake, grate the zest of both limes and reserve in a bowl wrapped in plastic. Juice both limes and add to a bowl with the coconut. Mix to moist evenly and let soak for 1 hour. Preheat oven to 325º. Butter or spray a non-stick 9-inch cake or pie plate with high sides. In a large bowl, sift flour and baking powder. Make a well in the center and add sugar, butter, eggs, coconut with juice and lime zest. Beat with an electric mixer for 3 or 4 minutes, until creamy. Pour into prepared pan and bake for 35 to 40 minutes, until a tester inserted in center comes out dry. Transfer to wire rack, let cool for 5 minutes and unmold. Let cool completely before icing. On a shallow plate of bowl, peel the lime, exposing the green part, and cut in segments, as shown here. Be sure to gather the pulp and the juice. Mix the powdered sugar in a bowl with the lime juice only first. When that is mixed add half of the segments. Some will crush and some will remain whole. When the cake is cool, drizzle the icing on top, letting it drip to the sides. Arrange the rest of the segments on top. Hi my friend! Thanks for this guest post, I love to be here. I hope Italy is treating you all well, and you´re getting some rest and time with the family. And great food of course! Lime soaked coconut – oh my stars!! Of course Paula would have such a fabulous idea. I love this one layer cake with a simple icing. It reminds me of tortes in Germany and going to the konditeri for cake and coffee in the afternoon. Lovely, simply lovely. Love the glaze. Love the cake. 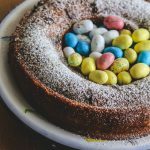 Simple yet gorgeous and flavorful cake! What can I do to get some? I guess head to the kitchen and start baking 🙂 …. I booked marked it and will bake it in no time. Nice to meet you Paula! This looks fantastic, I'm sure the lime flavor just explodes in your mouth! Pretty cake, I love the lime flavor! 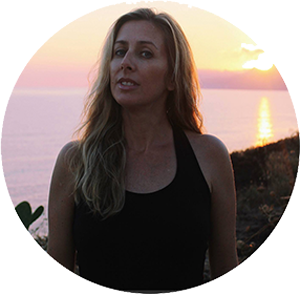 Hi, Lora – your blog is beautiful and I am so glad Paula introduced us to you! I look forward to perusing your blog, and am hoping you are having a great time in Italy – will look forward to some great Italian posts soon! 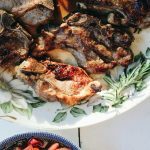 Fantastic guest post, Paula! I'm glad you were able to break from the coquito rut and into beautiful. 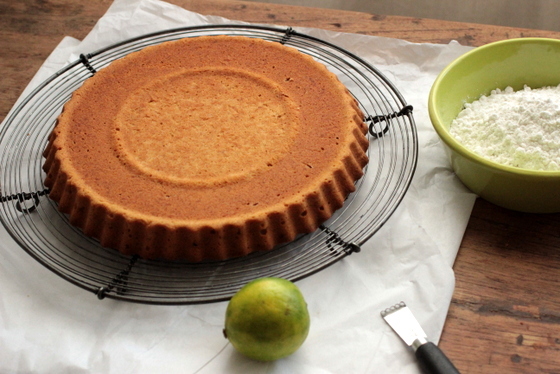 rich coconut desserts (with dulce de leche sounds amazing( like this cake. I'll bet you three forkfuls I could eat at least half of it in one sitting ;D BTW, if you cook down coconut milk and sugar – coconut dulce de leche! 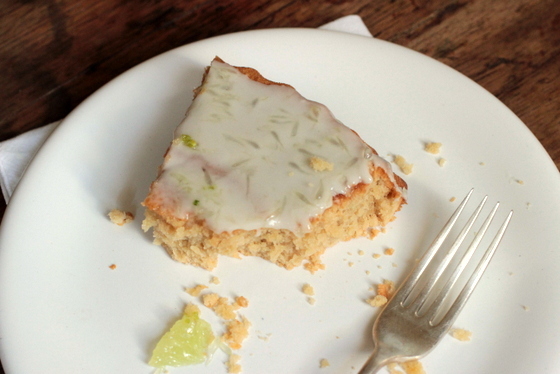 In the meantime, thank you for this fantabulous coconut and lime cake recipe from Paula. And the history behind the cake. Very much appreciate,too, the great tips about soaking the coconut in citrus for a bit. What a lovely combination. Looks delicious! I'm a huge fan of both of you ladies! I adore you both so I think this is one of the best guest post pairings I've seen in a long time. This cake – Paula, I'm swooning. 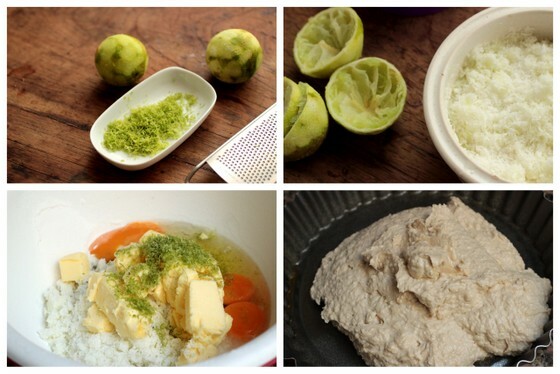 I love the time and care it takes to make this – the peeling of the lime (not simply zesting), the cutting of the pith and the soaking of the coconut in lime juice. Every step imparts so much more to this cake. I can't wait to try this – it's like summer in cake form! Paula, why didn't you start up a bakery or similar over there. It sounds like you are an avant gardist in your locality. I can tell that too just by looking at your cake and ingredients/technique choice. Laura thank you for featuring Paula here! Hi Paula, and Lora, such a wonderful guest post. 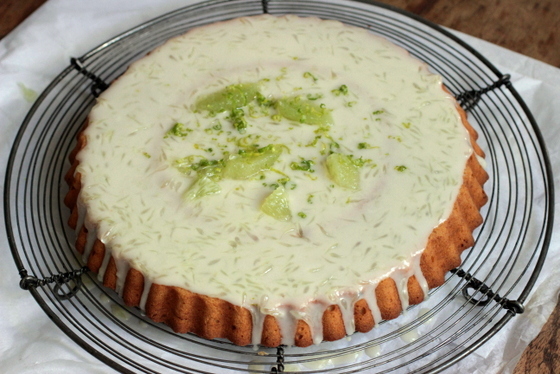 Love the beautiful and delicious coconut and lime cake,Paula! Coconut and lime combination is truly a favorite of mine. Thanks for sharing the awesome recipe! Will head over to your blog now! I don't have much experience with lime and coconut together, unless you count the song. 🙂 This is such a beautiful cake! I'm glad it turned coconut into a more positive experience for you. Thank you for baking Paula! It's good to see you here at Lora's! Greetings from Europe from a fellow baker! I heart Paula too. Great guest post. This looks so wonderful.